If Stephen's mother can resemble Hamlet's father's ghost, she also can play the part of Hamlet's mother. Stephen's grimly determined "No, mother" draws strength from Hamlet's anger at Gertrude, and also from Telemachus' rebuke of Penelope in the first book of the Odyssey. joy of song, wherever his thought may lead? what fate he pleases to adventurous men. a song that rings like morning on the ear. But you must nerve yourself and try to listen. never to know the day of his homecoming. Her son’s clear wisdom echoing in her mind. 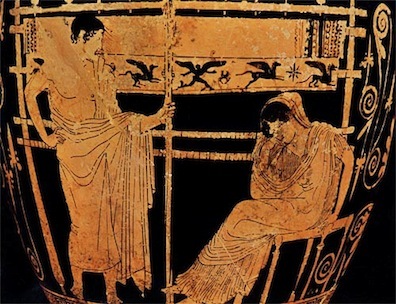 The talk of what “men” do and suffer marks this as a moment in which Telemachus leaves the maternal embrace of childhood and joins the company of other adult males. 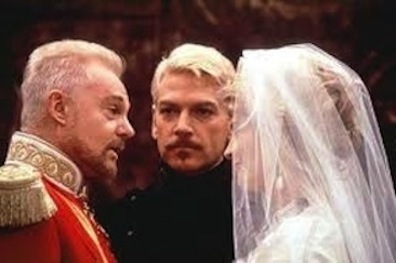 Still from Kenneth Branagh's 1996 film of Hamlet showing Derek Jacobi as Claudius, Branagh as Hamlet, and Julie Christie as Gertrude. Telemachus and Penelope. Source: odysseyconversation2010.blogspot.com.